Who decides the Future of Musicianship? 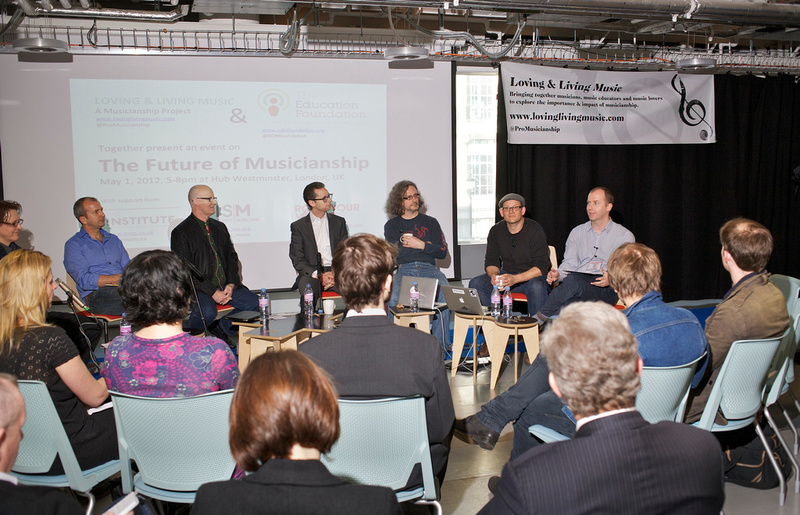 A few days ago I attended a fantastic discussion panel session at The Hub, Westminster, entitled “The Future of Musicianship”. It was the first event put on by the newly-launched “Loving and Living Music” project, brainchild of Ben Hillyard and Heli Rajasalo. What we are looking for in the Loving & Living Music project is a definition or a description of musicianship that includes all aspects of musicianship across all genres and instruments. Having this definition will enable discussion of musicianship to take place on a wider scale than is possible today. We see a gap in the way that music in commonly taught. With the Loving & Living Music project we are looking to provoke awareness and discussion among the music education sector about how Musicianship is and could be taught. The future of musicianship is a subject close to my heart due to my work with Easy Ear Training, where we try to use modern technology to make learning music more fun, easy and effective. The event was fascinating, and the discussion broad and interesting. I won’t try to recount the discussion (not least because the entire panel session is now available online) but the event was eye-opening for me in a number of ways. Musicianship is not what I thought. In my work at Easy Ear Training I live immersed in a world of aural skills and over time “musicianship” has come to be defined in my head as something like “listening skills, performance skills, collaboration with other musicians” and so on. The ‘soft skills’ which complement technique and instrument skills in a musician. So when I heard about this event, I suppose I was expecting a discussion around practical musical performance skills. In fact, the majority of the discussion covered types of musicianship I barely think about at Easy Ear Training. The panellists seemed to define “musicianship” as simply “the act of being a musician”, including aspects like musical careers, entrepreneurship in music, the music industry, the image and celebrity of being a rock star, and so on. Fascinating stuff, but not what I think of as “musicianship”! In fact, I learned afterwards that one of the core goals of the Loving and Living Music project is “to find a definition for musicianship” – so perhaps not so surprising to find some difference of opinions at the outset. Who decides on the future of musicianship? Again, it’s probably a product of my own biased viewpoint, but if I was going to assemble a panel to discuss the future of musicianship, I would start off by gathering some young (i.e. under 25 years old) musicians and some technology specialists. Because to me it’s obvious that the future of musicianship will be defined based on the impact of new tech for music education, and those musicians who already take technology absolutely for granted. Not by the music schools and institutions which, for all their enormous benefits and wisdom, are likely to adapt their methods very slowly and carefully, as they have done for decades. The panel represented a very interesting cross section… of the status quo. Forward thinking, but still very much a product of the traditional music education systems and music industry. And I found it difficult to decide how I felt about this. Was it oddly short-sighted when music learning and musicianship are undergoing such radical change powered by new technology (free music software on affordable laptops, easy music creation apps on mobile devices, music video games which teach as you play) – or was it just appropriately pragmatic, because these institutions are the ones which dictate what “real music education” is, and what we call “musicianship” won’t change unless they allow it to? But I found it quite jarring trying to reconcile the title of the panel with the generally quite historically-focused discussion and opinions shared during the evening. There were a few bright points. Andrew Dubber noted that the music listened to by young people is completely unrepresented in today’s music education curricula. He was also the first to acknowledge that music creation’s been hugely transformed by technology, a point which had somehow gone unmentioned for over 90 minutes of panel discussion before that. I managed to squeeze in a question (around 1hr41) about the impact of technology, and although a couple of the responses were a little dismissive, Paul Kirkham expressed what I think is the crucial point: the big power of technology is to pull out some of the boring work of developing musicianship, make it fun, and leave more classroom time for what really should be taught human-to-human. I thought Steve Lawson‘s contributions throughout the panel were inspiring – his focus on learning the creative and expressive skills of music rather than technique and syllabus seemed to me to be just the right attitude for the future of musicianship. It was encouraging that the overall tone was very inclusive (music learning for everyone!) and positive (things are changing, music is still enormously powerful). It’s certainly an exciting time to become a musician. But I found myself wishing the discussion had focused a bit less on how we can wrangle the existing systems into moving forwards, and a little more on what it is we should be aiming for – and how technology can help us get there. My thanks to Ben and Heli for putting on such a fascinating event. I’m looking forward to the discussion which will no doubt emerge over the coming weeks, on the official blog and elsewhere. Musicianship is an interesting and vitally important topic, and more than anything else the panel served to make clear that there’s a long way yet to go before we really understand what the future of musicianship will be. Thanks for joining the discussion Chris, both here and at the event, some really interesting points here. When we started the project, I too came to musicianship from an ear-skills and communication angle and have since had to expand my ideas of what it includes.